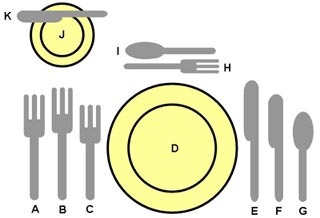 American Style or “Zig-Zag” (named by Emily Post) is when the right hand is used primarily for all three utensils. This is great for all you right-handers out there. But it leads to some complicated maneuvering and swapping of utensils. An example of a zig-zag would be eating a small piece of steak. The fork with tines down is held in the left hand to hold the meat stable and the knife is held in the right hand to cut. The knife is then set down on the plate. Then the fork with the piece of meat is transferred to the right hand to deliver the food to the mouth with the tines upward. The fork then returns to the left hand and the right hand retrieves the knife. Repeat until full. American Style leaves the left hand in your lap at times. By some this is considered an act of hostility. Don’t forget that the old “gun under the table” trick was used by every western gunslinger and even Han Solo. And keep your elbows off the table! European Style or “Continental” is much more efficient and left-hander friendly. Quite simply the left hand always holds the fork and the right holds the knife. The fork is always used tines down for holding and delivering food to the mouth. This style allows for the knife to be used to guide awkward foods to the fork. God gave you two hands, use them! People in Philippines, Singapore, Malaysia and Thailand use a fork and spoon. Read more about this in our posting. Do not finger the cutlery or anything on the table. Use it, don’t play with it. Hold the cutlery delicately, balance them on the fingers and controlled by the fingertips. Always treat a weapon as if it is loaded. Cutlery should never be handled, pointed or even set down that would indicate that they are indeed weapons. We are not savages. Do not overload the fork. Spillage will occur. Do not overfill the spoon. Spillage down your frontage will occur. Never put your knife in your mouth. It will end badly with a forked tongue. Never use the knife to cut more than one or two bites of food at a time. Unless you are assisting the elderly, a child or the disabled. Do not saw with the knife. To cut with the knife, slide it towards you and then lift and cut again. A soup spoon doesn’t go into your mouth; it feeds the food to your mouth. Soup is eaten from the edge of the spoon and taken from the far side of the plate by moving the spoon away from you. Never drink with the spoon in the cup. Place it on the saucer. Or you’ll put your eye out. And don’t hang the spoon off of your nose! Also, a spoon is not a mirror. Go to the bathroom to fix your hair. Now if it’s for “James Bond” spying purposes, then good luck with that. You should be ambiforktrous, as in ambidextrous with your use of the fork. Never eat anything with a spoon that can be eaten with a fork. As for spaghetti with spoon and fork? The jury is still out on that one. Never transfer the fork from one hand to the other. It’s a little too West Side story. Do not use the edge of the fork to cut food. That is why you have a knife. Hard cheese uses the fork and soft cheese the knife to deliver to the bread. If you drop a piece of cutlery, say goodbye as it’s gone, ask for another. Used cutlery should never touch the table lest it dirty the table cloth. Not even the handles while leaning against the plate. When you are finished your meal do not cross the knife and fork. Simply leave them parallel on the plate with the tines of the fork down and the knife on the right with the sharp edge facing the fork. And don’t put cutlery into a bowl or cup, it will fall.